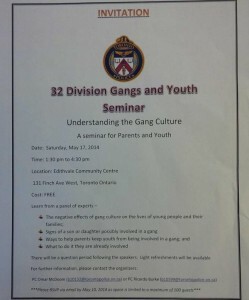 Toronto Police Sercie 32 Division in partnership the 32 Division Community Police Liaison Committee (CPLC) will be hosting an Gangs and Youth Seminar geared toward the education of parents and youths. 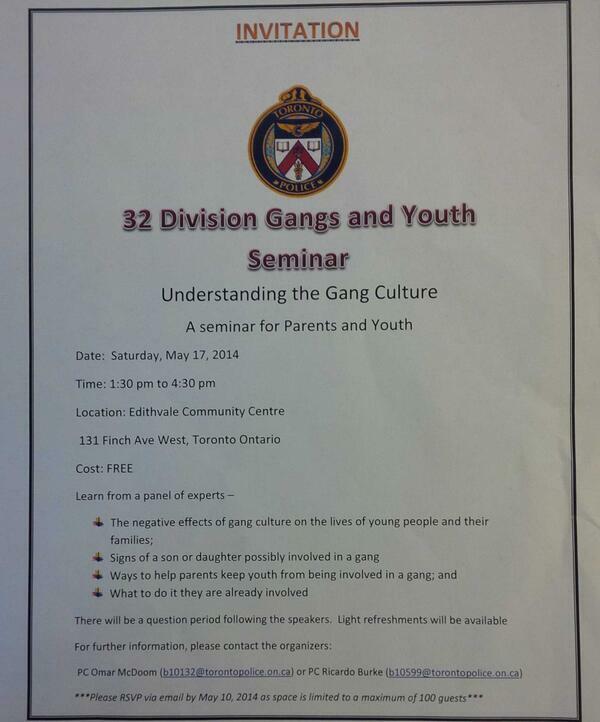 The audience will learn from a panel of experts about the negative effects of Gang culture, signs of a son or daughter possibly involved in a gang, ways to help parents keep youth from becoming involved in a gang, and what to do if they are already involved. There will be an opportunity to have questions answered by the expert panel. The panel will include speakers from Astwood Strategy Corporation, Toronto Community Crisis Response Program, East Metro Youth Services, and Toronto Police Service Guns and Gangs Task Force.